Coat a large frying pan with oil and on low heat, allow to heat up completely. Once hot, pour 1/4 of the mixture into the pan and cover immediately. Once bubbles start to appear on the edges, remove cover and flip and cook for 1-2 minutes. Repeat the process until you have four, large flatbreads. 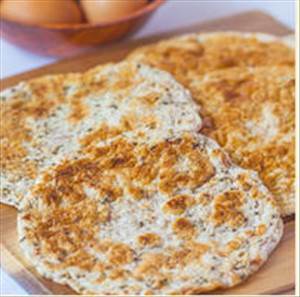 Note: flatbreads can be refrigerated for up to a week. Freezing them is not recommended, unless you heat them up again in the pan. You can add herbs of choice such as basil, red pepper flakes, garlic powder and rosemary. There are 84 calories in 1 serving of Flatbread. Calorie Breakdown: 14% fat, 27% carbs, 59% prot.